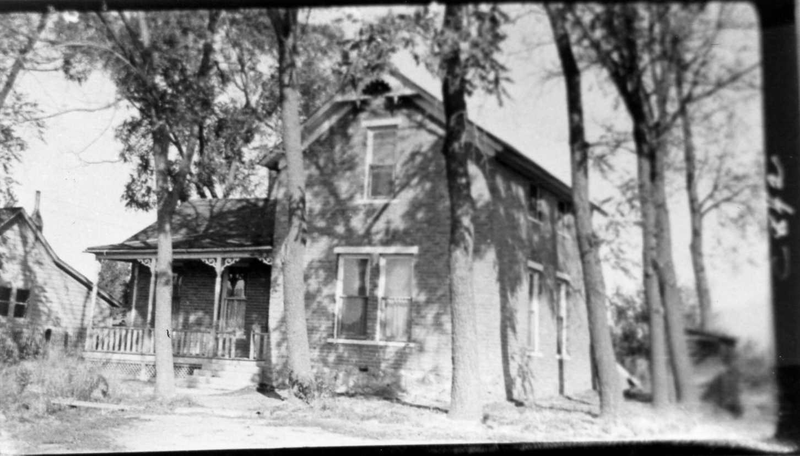 YESTERDAY: George Pierce House c. 1880 ; photo c. 1930, Weber County Assessor. TODAY: George Pierce House; photo 2009. The 1850s lane leading north from 2nd St. was entrance to east side of fort; now called Anderson’s Lane; photo 2006. 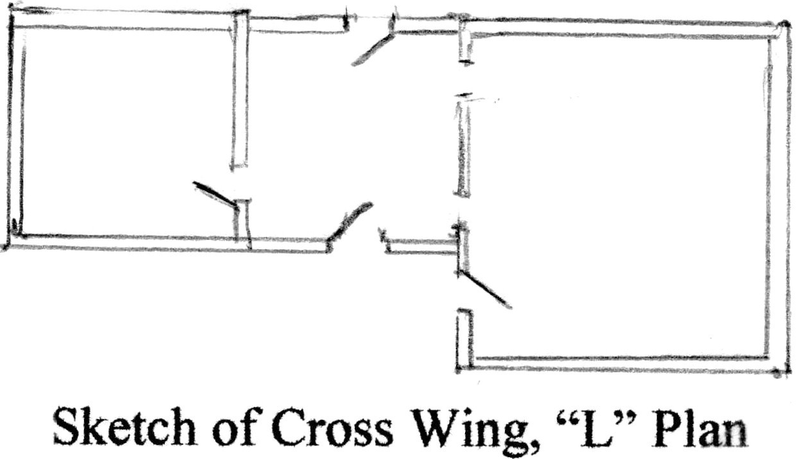 This cross-wing house consists of two sections placed at right angles, roof lines perpendicular; the floor plan resembles an “L”. 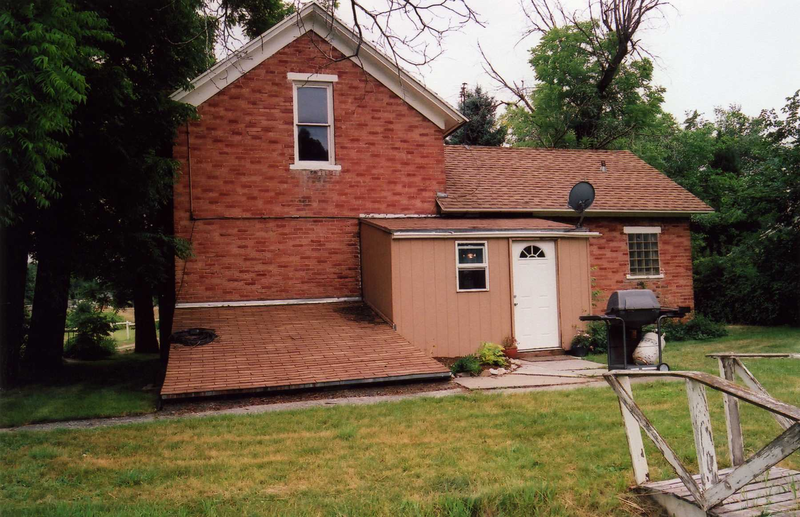 The one-story section has two rooms and two exterior doors, one in the front and one in the rear. There is a porch on the front and a lean-to on the rear. In the larger section there are two rooms on each level with a second front door on the porch perpendicular to the first front door. The second section added four more rooms making a large six room house. 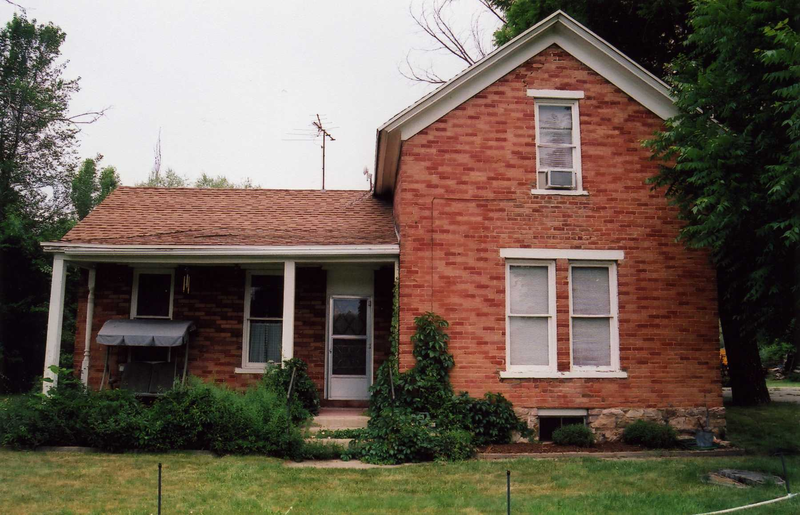 In the years after 1880, the cross-wing house replaced the hall-parlor as the most common Utah house type. 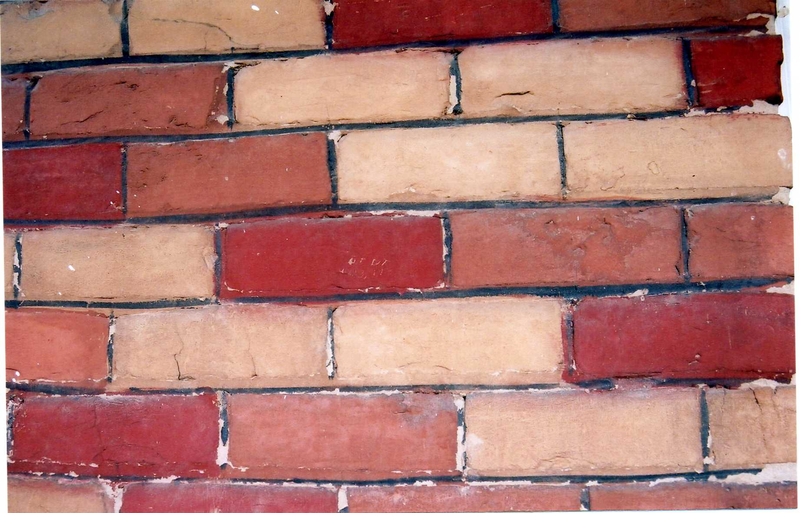 The orange burnt brick on this house is a mixture of hard fired adobe and soft fired adobe showing the uneven effect of the kiln. 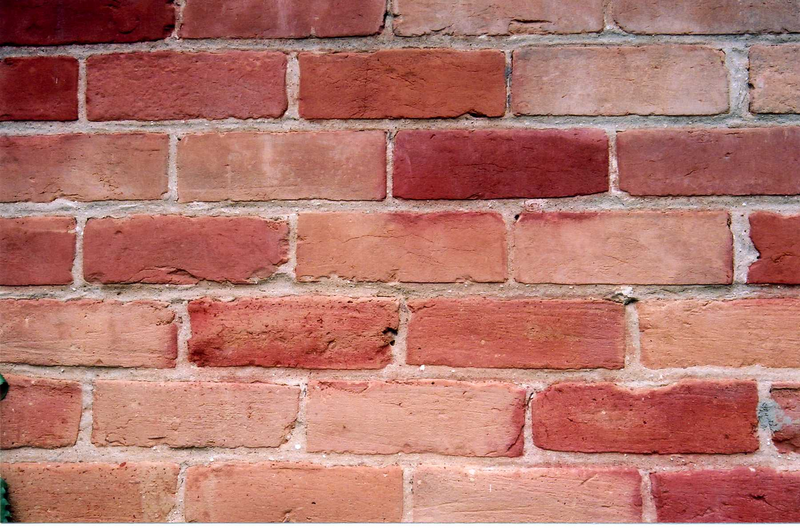 The size of the bricks is also irregular, averaging 2 and ¾ inches thick and 8 by 4 inches in length and width. It is most probable that these burnt bricks were made by the Gates Adobe-Brick Mill. The three foot rock foundation was built with stone brought down from the mountains, and it protected the burnt bricks from moisture and dripping rain. By about 1880 George and Jane Romrell Pierce’s board house at 142 West 2nd Street was too small for their eight living children, and they built this burnt brick house about 40 feet to the east of their first house circa 1880. See 142 W. 2nd for details about the Pierce family. Jane beautified the home with flowers and trees. She sewed the families clothing and sold fruits and vegetables from the home garden. In addition to farming George conducted real estate transactions and sold newspapers from the east. He died in 1898 and Jane in 1909. Two of the Pierce children, Porter and Fred, continued to live and farm on 2nd Street, building homes for their families. Porter built the large house at 141 2nd Street in about 1900 and rented it. The house was two stories with Greek revival styling and a variety of surface textures and materials, giving it a very stylish appearance. One of his renters was widow Jane Ann Mills who had more living space than needed for her family, so she turned Porter’s house into a boarding house to earn money. She is pictured below visiting the Sully family next door; on the right is a clear view of the house she rented from Porter Pierce. 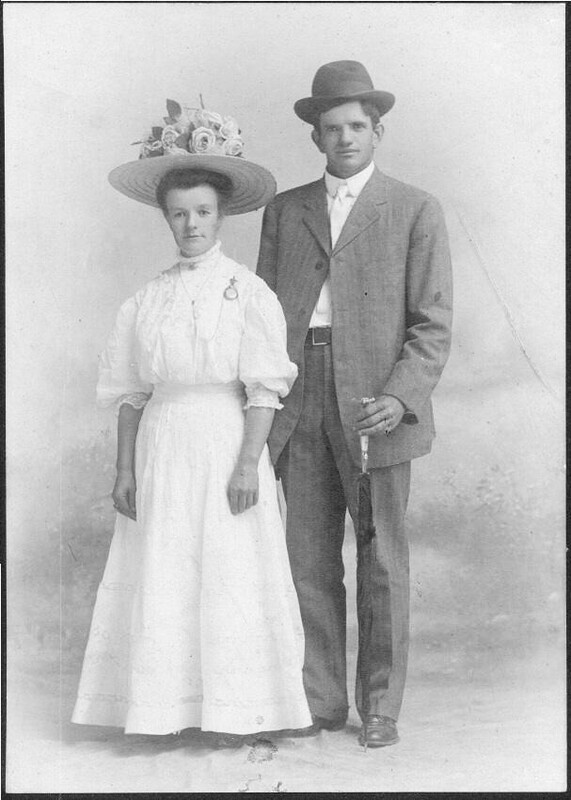 Mr. and Mrs. Porter Pierce; photo c. 1900. Porter later married Gretje Smit who immigrated in 1903 from the Netherlands with her parents as converts to the Mormon church. At this time he quit renting the house and moved in with his bride. Porter’s brother Fred married Hilma Hallen and built the bungalow house at 233 2nd Street in the 1920s. Fred and Porter were both farmers, and Fred was a director of the Lynne Irrigation Company. 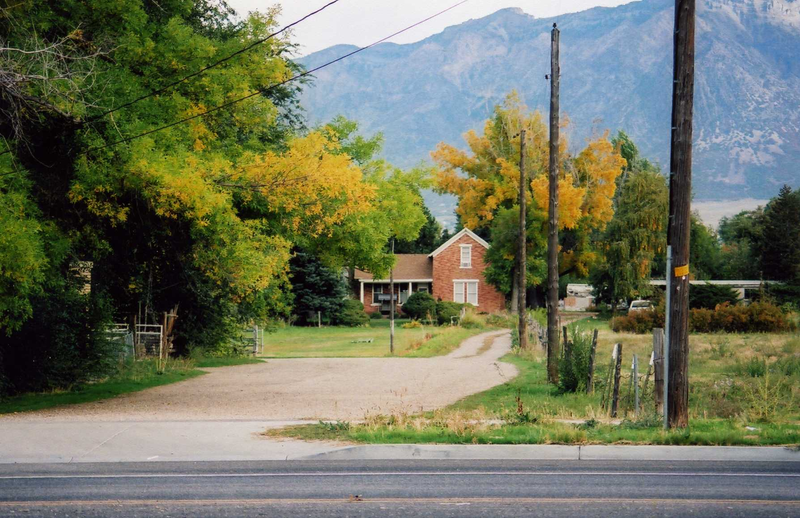 In 1939 Lyman and Violet Anderson bought and restored the c.1880 George Pierce pioneer home. In the 1950s Mr. Anderson and his son dug a cellar under the east section of the house, one shovel full at a time; the stairway to the cellar is in the rear lean-to. Next to the lean-to they made a sixteen foot extension of the cellar with a sloping 4 foot high roof for the purpose of dumping coal. The Andersons also hand painted some of the exterior bricks dark red and the mortar black to enhance the appearance of the burnt brick. Hand painted bricks & mortar under porch roof. In time the sun faded the painted mortar and diminished the paint on some of the bricks. Rear view shows extension for dumping coal. In the 1940s as an engineer for OUR&D, Mr. Anderson drove the train on the Five Points branch on the south side of 2nd Street. When driving the train up 2nd Street and approaching his home, Mr. Anderson would blow the whistle, and his young son would run down the lane and ride with his father to Five Points and back again. Since that time the lane has been known as Anderson’s Lane. Cory Jensen, Historic Architecture in Utah: The Cross Wing, Utah Historical Quarterly, Spring 2001; Thomas Carter and Peter Goss, Utah’s Historic Architecture, 1847-1940, 1988, Utah Historical Society, p.37-43. Observations by Gordon Q. Jones in 2001 during on site visit, author of Pioneer Forts in Ogden Utah, 1996, Ogden Chapter SUP. Pioneer Women of Faith and Fortitude, DUP, p. 2399. Deborah Blake, Family Jewel, Standard Examiner- Historic Homes, 2003. NOTE: From 1853 until 1935 Anderson’s Lane was not dead-end; it was a lane connecting 2nd Street to North Street and extended on to the intersection with Larson’s Lane (then called Greaser Larsen’s Lane) and the N. Harrisville Road. In about 1935 Wall Ave. was built, and Anderson’s Lane was shortened to end at North Street; the lane remained a private road. Today the lane runs north off 2nd for about 300 feet, curves west for about 200 feet, and then turns north again ending at the residence at 142 W. 2nd. In 1853 the westward 200 feet portion of the road was the original east entrance into Bingham’s Fort.